Tom Kreisler has been described as one of New Zealand’s finest and funniest painters. Migrating from Argentina as a teenager, Kreisler developed a practice that sat distinct from many New Zealand artists at the time. While others looked inwardly to the specificities of their local experience, Kreisler looked outward to the world with great vitality and humour. His works are marked by a lightness of touch, and as we see in Prosaic mosaic, take much delight in the poetry of everyday existence. The imagery in the centre of the painting, a frame with layers of loose jigsaw patterning and an outline of New Zealand, recalls a corkboard in the kitchen of the Kreisler family home upon which the artist would collage various notes, lyrics and pictures. The artist’s son indeed remembers his father cutting out a map of New Zealand from the weather section of the local Taranaki Herald and pinning it on this board. Kreisler was drawn to the strange, meaningless symbols of illustrated pressure systems and the accentuated sense of smallness that could be induced by a map, and completed a broader body of paintings depicting weather patterns and maps throughout the 1980s. 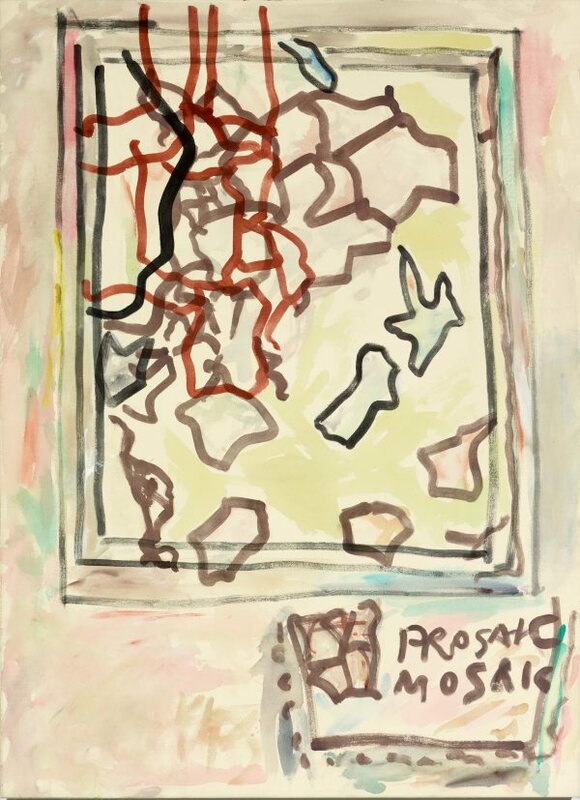 Not only does Prosaic mosaic highlight Kreisler’s formal preoccupations with its fluid, economised line work and thin veils of colour, but also, through its title, points to the artist’s sustained interest in poetic expression and word play.